So with this post I am up to date with the mega cool cassette releases Impose Magazine has pumped out the past few months. And its funny that I listened to them in non-sequential order, because in some weird way I think it makes more sense. First was the space ghost jams of Blissed Out; then the frenetic wizardry of Weekends. In some ways I think if you married these two up, or at least artificially inseminated one with the other's sperm, you would come up with a pleasant mistake such as Boston's Birthdays. 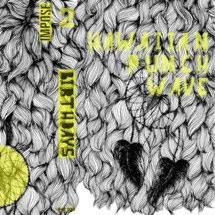 Their Hawaiian Punch Wave, less than a month old, is muddy experimental electronic pop, the flourishes evident in the cymbal crash and the constant static that is more comforting than confronting. Im definitely interested in hearing more. Im glad to now have in my possession a couple of cassettes - I havent owned any since I last made my own back in 2000 - and it feels...like home.